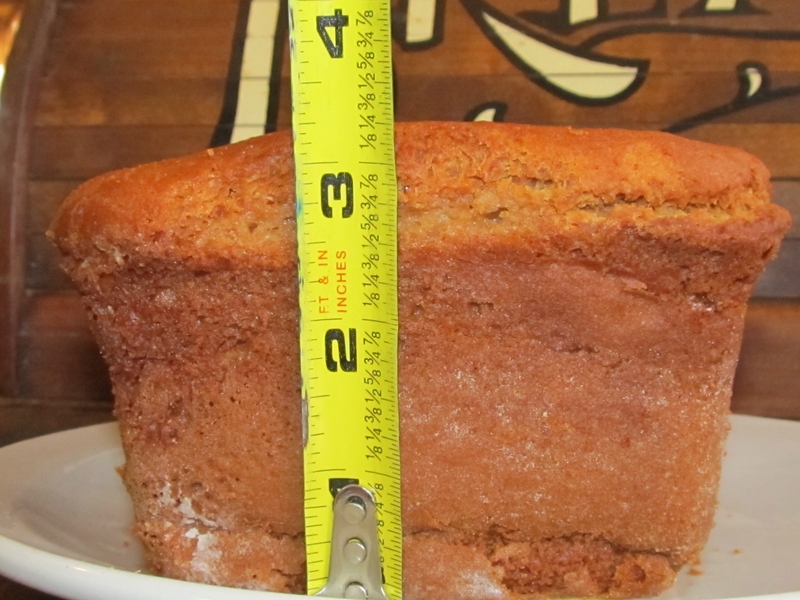 This is not my large loaf recipe, as you can see it only measures a little over 3 inches tall, but it is my everyday white bread recipe. I use this for sandwiches etc. and to toast for croutons to add to my stuffing for Thanksgiving. I will post the seasoned crouton recipe (similar to Pepperidge Farms only GF) in a few days. 2 Cups Tom Sawyer GF & Betty Crocker GF Rice Flour Blend mixed (see the recipe in the previous post) If you use Betty Crocker flour alone, then you must add ¼ Teaspoon of xanthan gum. In mixing bowl whisk together the 2 cups flour with the baking powder, salt and baking soda. In small bowl melt butter, just until soft don’t get it too hot ( or it will kill the baking powder) add water and oil. Add butter, water and oil, to flour mixture, then add egg whites. Fold in all liquids and flour until all of the flour is moist. Let this set in fridge for at least 20 – 30 minutes, so that the rice flour can absorb the liquids. I like to make this dough up the day before and just let it set in the refrigerator overnight. In medium glass mixing bowl, add sugar, scalded milk, & water. Stir to dissolve sugar. Temperature should not be over 110 degrees. (It will kill the yeast) Add yeast and mix with plastic whisk. Set aside and let it foam and rise for about 20 – 30 minutes. I like to set it near the stove while I’m cooking this will activate the yeast. Preheat oven to 325* Add a 9×13 inch baking pan filled half way with water to bottom rack of oven. This should keep bread from cracking on top. When you are ready to make the bread, remove the dough from the fridge and spoon it into the food processor or mixer. (I like to use the food processor.) Then pour yeast mixture over the dough and mix until all lumps are gone. I mix it on high for a very short amount of time, in order to get air into the dough. Just don’t over work the dough, it will make the bread tough. When dough is smooth pour into greased and floured (with GF flour), 9×4 inch loaf pan. Smooth out dough with a buttered or oiled spatula. I set the loaf pan on the back of the stove to let the dough rise for about 30 minutes. Do not punch down dough before you bake. When dough has risen to about ¼ to ½ inch above loaf pan it is ready to bake. Place loaf pan on rack directly above the pan of water. After bread has been in the oven about 30 minutes slide it over, so that loaf pan is not directly above water. This will let the bottom of the loaf brown, and bake for another 20 – 25 minutes. Total time is 50 – 55 minutes. Insert toothpick in the center, when it comes out clean bread is done. Cover with foil and let bread rest in pan for about 15 minutes. After you remove bread from pan stand it on its end, and wrap loosely in foil. You may have to lean it against something to keep it from toppling over. This will keep bread from squatting and it will hold its shape. When completely cool store in air tight container or zip lock bag.